Google Wallet is an Android app that will allow you to use your cell phone as your "wallet"; that is, you can use NFC (Near Field Communication) to tap a special station at a merchant to pay by phone. 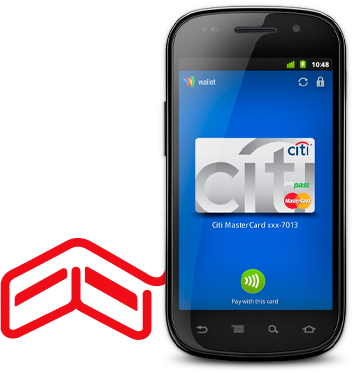 At launch, consumers will be able to use Citi® MasterCard® cards and the Google Prepaid Card with Google Wallet. Google promises that you will be able to simply "tap to pay" at hundreds of thousands of merchants. Fans of sf great Frederik Pohl recall that the Joymaker PDA from his 1965 novel The Age of the Pussyfoot has a great feature besides making phone calls: the user can use it as a kind of cell phone credit card.